Russian ombudsman to personally check observance of Vyshinsky rights by Ukrainian court | Russian Legal Information Agency (RAPSI). MOSCOW, March 20 (RAPSI) – Russia’s High Commissioner for Human Rights Tatyana Moskalkova came to the Ukrainian Supreme Court to personally check the observance of rights of journalist Kirill Vyshinsky, the ombudsman announced on her Instagram page on Wednesday. Today, the Supreme Court of Ukraine will review an appeal judgement on arrest and detention of Vyshinsky. Earlier, Moskalkova applied to Ukraine’s ombudsman Lyudmila Denisova wishing to attend the court hearing. Vyshinsky has been detained in Ukraine on treason allegations. 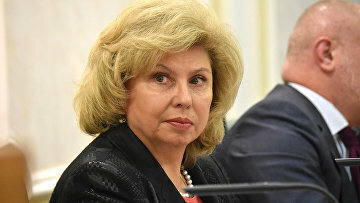 Moskalkova has repeatedly requested international organizations including UN, Council of Europe and Organization for Security and Cooperation in Europe (OSCE) to speak in defense of the Russian journalist. According to the ombudsman, the case against Vyshinsky and his detention are illegal. Russian President Vladimir Putin previously said that Vyshinsky was arrested and detained for his professional journalistic activities. He also called this policy of Ukrainian authorities unprecedented and inadmissible.